The beauty of a hiking trip to Garda is the diversity of terrain. The lake has a broader profile where the land is flatter in the south, and tapers as it stretches around 50 kilometres to its northernmost tip. The countryside surrounding the south of the lake is reminiscent of Tuscany with gentle hills covered with olives trees and cypresses, while the further north you go the more dramatic the scenery, especially right at the top of the lake where it cleaves through the peaks of the Brenta Dolomites. This is a simple trail without any technical difficulties, but requiring stamina and fitness for the steady ascent to the peak followed by the long descent to the start point. Monte Stivo is one of the region’s most panoramic peaks, making it well worth the effort to get there. The trail begins at Sant’Antonio pass and leads up through woods and then pastures to the summit at 2039 metres. The last steep section leads you to the Rifugio Marchetti, just below the peak. Choose a clear day if you can because the views are staggering from the top, and there is an information panel to identify the landscape visible all around you, from the northern extremities of the lake at Riva and across the Busa plateau to the Ledro Alps, south to Monte Baldo and north to the Brenta Dolomites. The view on a day with good visibility encompasses a huge altitude range – from the lake shore at 65 metres to the crest of Ortles peak at a lofty 3905 metres. The entire ‘Path of Peace’ covers more than 500 kilometres through Trentino, linking important locations from the First World War. Not only is it a historically and culturally significant route, but it also impresses from a naturalistic perspective. The three stages which curve from Riva del Garda to the summit of Monte Altissimo offer an insight into the battles that took place here as well as an opportunity for remembrance, but also wonderful views and immersion in a unique natural environment. The first stage leads from Pernici refuge down to Riva, and apart from one cabled section at Bocca Saval presents no particular challenges, though the constant descent will require well trained knees and good general fitness and stamina. You can see numerous remains of Austro-Hungarian barracks, defensive positions and trenches. The second stage is shorter to allow plenty of time to visit the various forts of Monte Brione and the two at Nago, the end point. On the final day the trail rises from Nago village first to Malga Zures where remains of trenches and artillery pitches made by the Italian army can be seen. It then continues up towards the summit of Monte Altissimo at 2079 metres where there is a chapel of remembrance and blistering views over the entire lake when there is no haze. The brilliant Garda Trek initiative is a trio of multi-day hut to hut routes which loop around the mountains at the northern end of the lake. Between the three itineraries there is something for every season and every level of hiker. The Medium loop covers 72 kilometres across 4 days, winding at mid-altitude through the hills around the Sarca Valley, opening up fantastic views and taking in some of the true beauty spots of the area, such as the small lakes of Lago di Tenno and Lago di Ledro. The Top Loop requires seven days walking to complete, staying in refuges at altitude most nights. The route encircles the peaks at the north of the lake known as ‘the Crown of Garda,’ and though no ferrata gear is required, it’s a challenging route with several exposed sections and suits experienced hikers who are used to altitude. The 95 kilometre trek includes a number of peaks above 2000 metres, meaning fantastic views as long as you have a head for heights. The Low Loop is a two day route which weaves across olive groves, farmland, low hills and historic monuments around the Busa plain in the valley of the river Sarca. Day one takes you from Riva to Arco Via Tenno, and day two crosses the valley to wander through more wonderful scenery back to the lake shore via Nago and Torbole. This loop can be undertaken all year round and apart from the length (6-8 hours walking each day) it doesn’t present any particular difficulty. 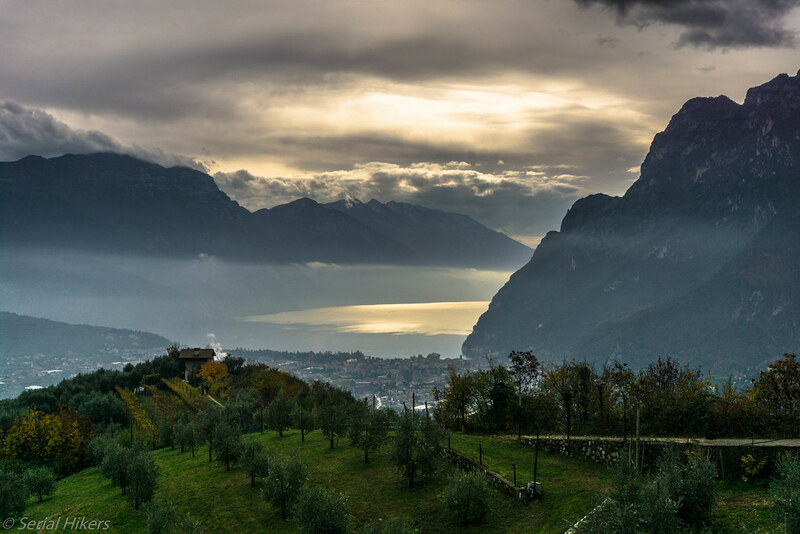 If you are on the lookout for tougher mountain trails, it makes sense to base yourself in the lakeside towns of Riva del Garda or Torbole, right at the top of the lake where the mountains are at their most dramatic and access to high trails is simplest. These two towns are well supplied with accommodation at all price points, and they both overflow with shops selling equipment for every kind of outdoor adventure you can think of. The neighbouring towns both have pleasant historic centres and a number of cultural sights, for example the church of Sant’Andrea in Torbole, which dates back to the 12th century and from its perch above and behind the town offers a great view over the harbour and the shoreline beyond. 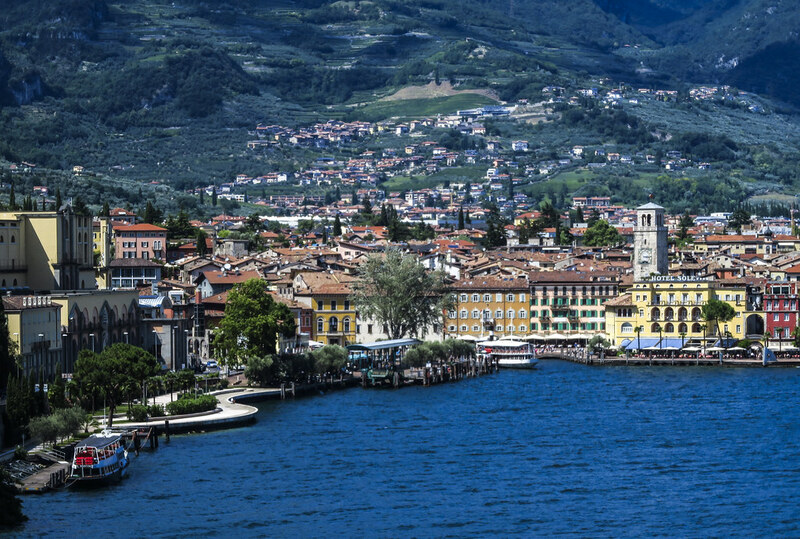 Riva del Garda is by far the bigger of the two towns, and has an appealing lakefront centre with some historic sights. The Rocca sits on its own little moated island and can be reached by a drawbridge to investigate the Museo Alto Garda where you can see archeological and artistic relics from the region, and learn more about how the First World War affected the population. The Chiesa dell’Inviolata, found towards the north of the Centro Storico is a fine example of a baroque church, and is one of the most celebrated in Trentino. There are plenty of other resort towns further south on the lake shore, all of which have their appeal, but the two towns at the far northern point of Lake Garda have the best access to many of the region’s most iconic hiking trails. If you prefer gentler walking head for Lazise, Garda, Bardolino, Manerba or Salò where access to the lower hills of the southern lake is straightforward. As well as the abundant natural beauty and benign climate of the whole Lake Garda region, there is a wealth of historic and artistic heritage to discover. The ‘Tesori Nascosti’ or Hidden Treasures walks are a collection of well waymarked day routes in the area around the northern end of the lake. They each showcase a different aspect of local history and heritage, and give easy to moderate walks an interesting focus, for example the sacred art itinerary which links ancient churches in the surroundings of Arco, each with unique architectural features and frescoes to discover. The ‘Sentiero della Maestra’ shadows the route that a dedicated teacher named Ketty Bombardelli used to take every day from her home in the hamlet of Braila down to the schoolhouse in Dro. It’s actually quite a tough round trip with some steep exposed sections, the most difficult walk of the Hidden Treasures series. 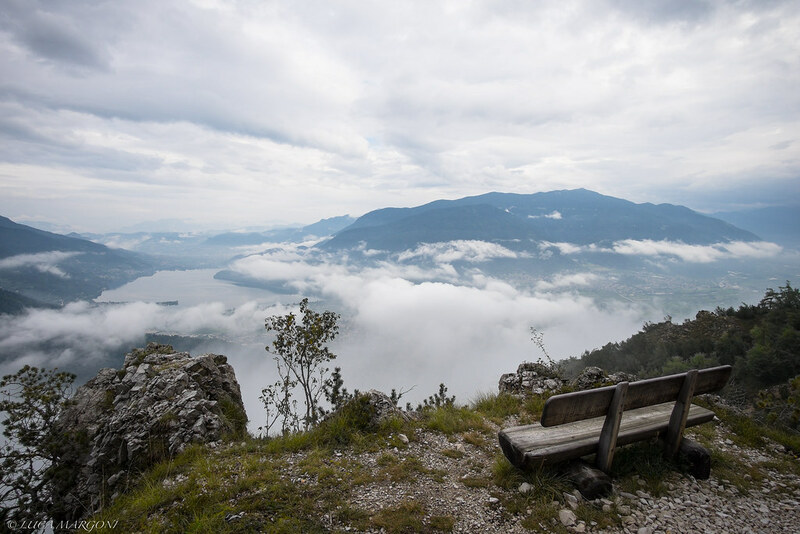 Other routes include trails which follow in the footsteps of prominent artists and writers such as Goethe, Rilke and Dürer who have all spent time in and around the Garda Trentino towns. Some of the most impressive walks in the series are those that show off the medieval heritage in the hills behind the lake, joining villages and monuments that retain their medieval character. 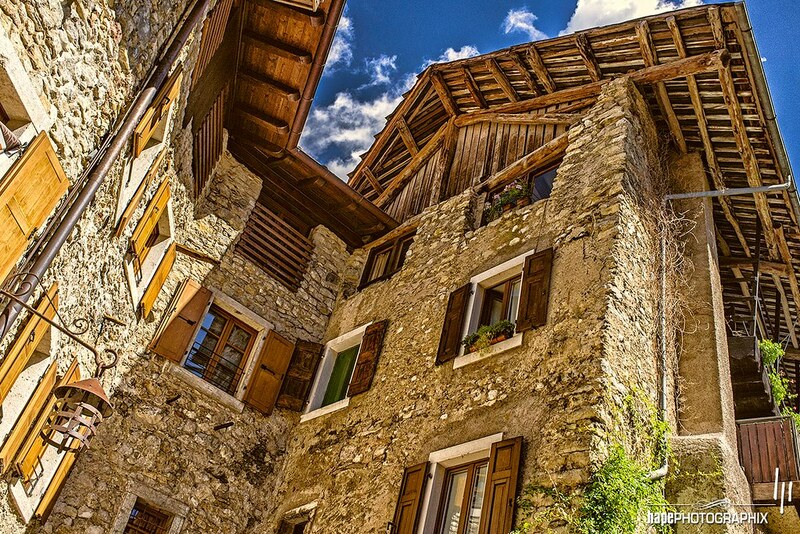 A highlight is the village of Canale, one of the ‘Borghi più Belli d’Italia’ – Italy’s most beautiful villages. Discover Italy on foot with our hiking trips, and other Italian adventures.